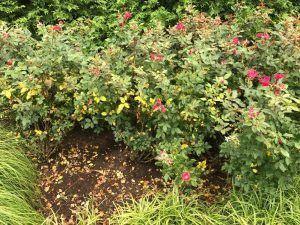 Most plants growing in Maryland rely on transpiration, or water loss due to evaporation, in order to stay cool. This is why keeping your plants watered in the high heat is so important. However, heat stress and dehydration are not the same thing. This is as true for humans as it is for plants. In a situation of high humidity and low air movement, cooling via transpiration can be very difficult. During this time, you might start to see some of the signs and symptoms of heat stress on your less tolerant plant species. If a plant is unable to cool off, several of their cellular membranes and proteins may start to become damaged. The cells responsible for photosynthesis, a process by which plants make food, are some of the first to be negatively impacted. This is one way that prolonged periods of heat stress can cause whole plant death. Figure 1. 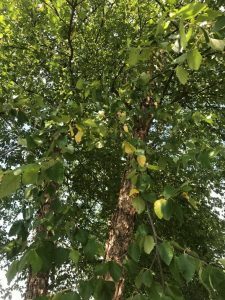 (Left) River birch dropping leaves in early July due to heat and drought stress. 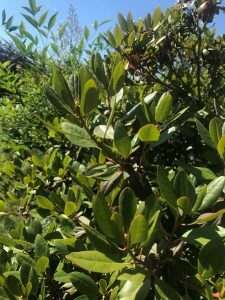 (Right PJM Rhododendron beginning to roll leaves in order to avoid absorbing excess light. Figure 2. Knockout Roses in July. Interior growth is yellowing and dropping. This is an adaption where the plant tries to avoid absorbing excess radiation or heat. Leaf drop also helps increase air movement throughout the plant. Finally, even if a plant doesn’t start showing symptoms of heat stress, they may be more prone to infection by a pest or disease. During the summer months, pests such as thrips and mites. At Mead Tree and Turf Care, we help clients manage heat and drought stress through irrigation adjustments, addition of soil amendments, deep root fertilization, and targeted spray programs to address secondary pests. A Certified Arborist or Professional Landscaper can help choose the right plants and help minimize the impacts of severe heat and drought in the landscape.